T&D distribute duct seals, cable and pipe transit systems to protect against water ingress and gas escape through cable duct and service entries into substation basements, cable vaults, switchrooms and access man-holes. Duct sealing systems include CSD Rise Duct Seals and Denso Mastic Duct Seals. 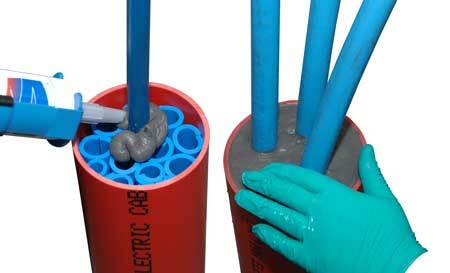 CSD RISE duct seal system is a multi-cable and pipe transit sealing system. CSD RISE provides an effective and simple solution to all fire, gas and watertight duct sealing requirements. The duct seal system will provide a certified pressure rating of up to 2.5 bar and can be made fire tight by using fire resistant RISE duct sleeves. The CSD Rise duct seals are in service throughout the water (Scottish Water, Welsh Water, Wessex Water, Thames Water, Southern Water, Severn Trent), electricity (EDF, NEDL, ENW, UK Power Networks, YEDL, SSE, Scottish Power) and telecom industries (BT Openreach). CSD RISE duct seals are in service on MOD (Tyne 45 Destroyers), London Underground Limited (LUL), BAA (T5 Heathrow) and National Grid sites. CSD RISE duct seals provide widespread service in the oil and gas industry including Shell, Talisman, Total and BP offshore platforms. Suitable for new or existing, empty or multi-entry duct sealing. Simple and effective : RISE Duct Seals are a multi-cable and pipe transit sealing system providing an effective and simple solution to all fire, gas and water tight duct sealing requirements. Few Components : RISE Duct Seals system consist of only two components - 1) rubber insert sleeves used to guarantee cable separation and as a backing for the sealant layer, 2) FIWA sealant, a high quality silicone based, fire resistant, water repellent sealant which makes the duct seal system quick and easy to install. Water and Gas Tight : RISE Duct Seals provide high elasticity and bonding strength which resists movement, shock and vibration providing a stable duct seal. RISE rubber insert sleeves are applied to provide cable separation and a backing for the application of the FIWA sealant. 60mm RISE sleeves are adequate for water and gas tight duct sealing. Fire, Water and Gas Tight : RISE Duct Seals using rubber insert sleeves at a length of 160mm and applying FIWA sealant to both faces of the opening will provide a fire tight duct seal. Flexible and Versatile : RISE Duct Seals can be used in vertical and horizontal ducts. RISE rubber insert sleeves cling to the cables without sliding down and falling out of the penetration. The high adhesion and viscosity of the duct sealant means it will not run or drip when applied overhead. 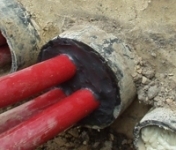 Adding and Removing Cables : RISE Duct Seals allow the installing of additional cables - it is a simple matter of coring into the soft rubber of the sealant to a depth of 20mm and passing the additional cables through the opening created. The duct sealant is then applied around the new cable to re-seal - there is no need to disassemble the transit system.